Frames break, glass shatters, and a beautiful picture remains in drawers or buried amongst hundreds of pictures on your mobile device. Isn’t there a way to cherish the pictures in a unique and not so technological way? When there’s CanvasChamp, there is always a way. We can provide you with a hassle-free method to display your memorable moments proudly in your home. Have you heard of tabletop canvas? Tabletop canvas is-an artistic and stunning way to share your memories with your friends and relatives. You can choose from four amazing and totally different options, canvas prints, metal prints, acrylic prints, and engraved plaques. You can opt for premium or flat tabletop canvas. If you hate seeing an empty space on your desk, mantel, or table, you will like our ultra-thin and flat tabletop canvas prints. 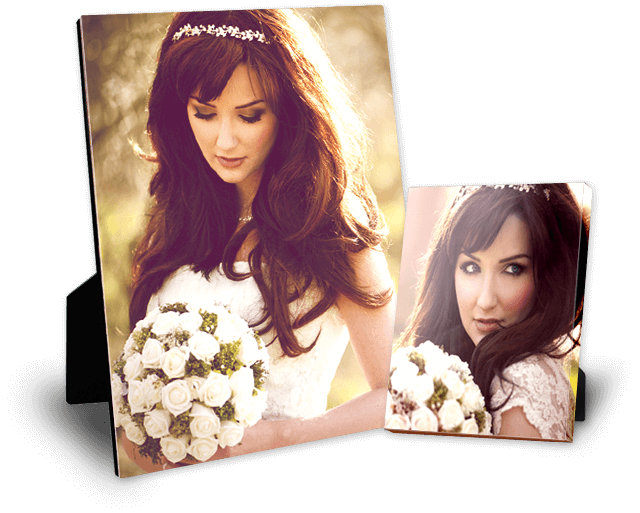 Our premium canvas is about 0.5 inches in thickness with your image wrapped tightly around the sides. You can hang it on the wall using an easel or place it on your table with a stand. Their compact and striking design makes them stand out from conventional forms of picture display. They make wonderful gifts for friends, family, and coworkers. 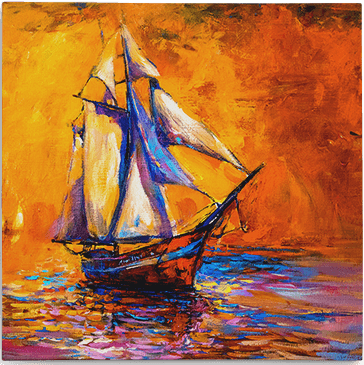 It is available in different sizes, ranging from 8" x 8" to 12" x 12". Do you want to display a wonderful and special moment in your life? You need to display your wedding, your first anniversary, the birth of your child, and several other special moments in a manner that would wow people. 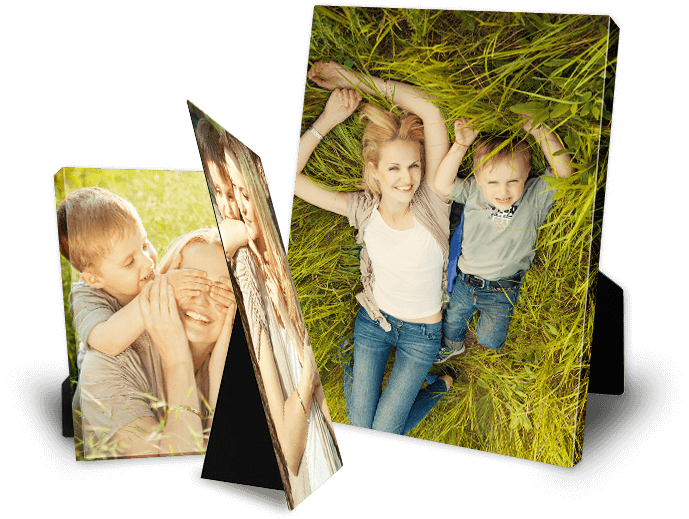 Instead of opting to leave the pictures intact in an album or enclosed in a frame, you should invest in metal prints. You can make the metal print the star of your wedding or baby album. You can also opt for the standalone option, which is a sleek and thin design. How you display the metal print is up to you. Our metal prints are available in different sizes, from 8" x 8" to 12" x 12". Do you want the colors in your picture to pop out? You can make your ordinary brown table the center of attention when you place our acrylic prints on it. We print the picture directly onto the acrylic. You can hang the acrylic on the wall or place it on your table. We provide our customers with an easel, at no cost to them, to place it on the wall. The lightweight modern design is one of the reasons people choose acrylic prints. We have made our acrylic prints available in different sizes. Our smallest size is 8" x 8" and our largest size is 12" x 12". Sometimes we need a reminder to cherish a memory so why not make that memory trigger a stunning engraved print. 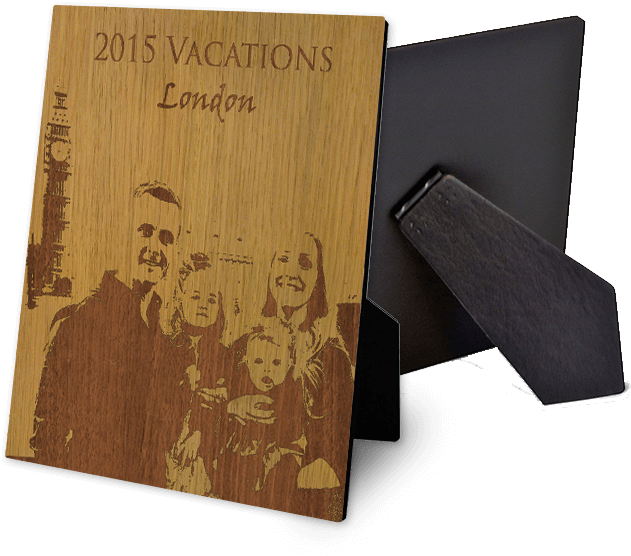 We can engrave your picture on a wooden texture. We print the picture directly on the canvas. 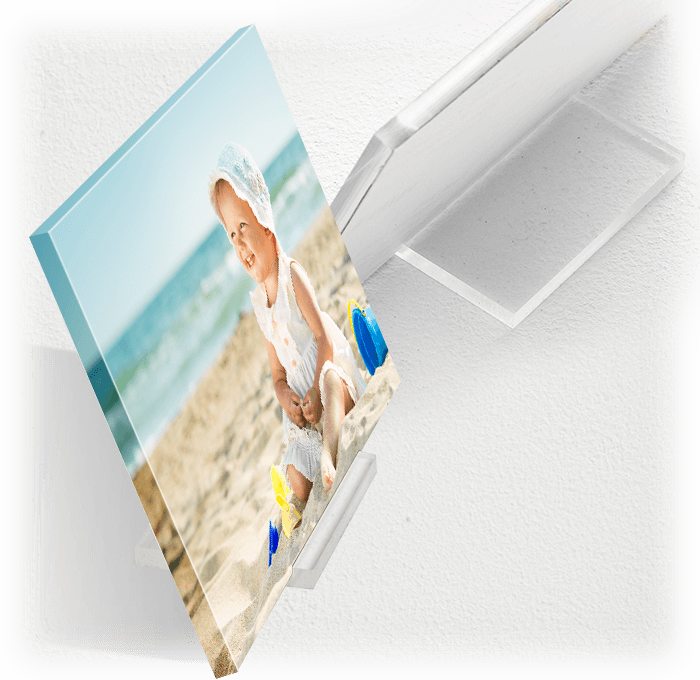 By choosing to display your picture on an engraved print, you are choosing to stand out. When people visit your house, their gaze will certainly land on the distinctive picture sitting on your desk or hung on your wall. Choose the engraved print if you want your pictures to look special. We can create a size small as 8" x 8" and large as 12" x 12". Our tabletop sizes are available in 8" x 8", 8" x 10", 8" x 12", 10" x 12", 10" x 10", and 12" x 12". On special orders, we can exceed 12" x 12". We offer finish options such as wrap and if you want to hang the picture, and we will provide an easel at no additional cost. Wedding photos are the most cherished souvenirs from a day that goes by all too fast. The most thoughtful wedding gift ideas are the ones that help pay tribute to that special day. We're sure that you will discover the best prices here. 100% satisfaction guarantee! All frames are handcrafted with passion and the highest level of museum-quality CANVAS. Receive your prints in just 5-9 business days delivered to your doorstep. Free Shipping on over $69. We are available24/7. Feel free to ask us anything at any time. Read our FAQ.